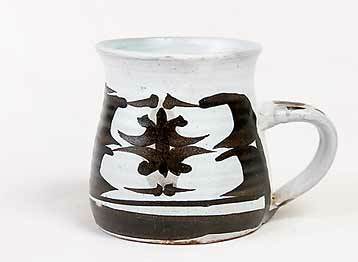 Wye mug - 3½" (88 mm) high. Adam (Adaš) Dworski was born in 1917 in Rijeka, (which is now in Croatia) at the beginning of a very turbulent period in the area's history. In 1954 he married and settled in Wales, starting Wye Pottery in Clyro, Radnorshire (now Powys) two years later. He had been an accomplished skier and founded a mountaineering society in his native Croatia, and felt at peace amongst the mountains of Wales. He is primarily known for his decorative work although domestic wares were also part of Wye Pottery's output. His use of rich colours on his flatter pieces, plaques and plates, which often gives them a 'jewelled' or 'stained glass' appearance contrasts with the subtle tonings of his more sculptural pieces. Although undoubtedly a very fine artist, he preferred to think of himself as a craftsman. His work is sought-after and he holds the distinction of having been chosen to supply two pieces for Sir Basil Spence's new Coventry Cathedral, and a black Madonna for Coretta Scott King, widow of Martin Luther King. When he was in his eighties and the exertion of throwing and firing clay became too much for him he took to graphic arts, using pastels and acrylics. Towards the end of his life he and his wife, Paddy, moved to Burgundy where he died in March, 2011. The Wye Pottery was set up in 1956 by Adam (Adaš) Dworski, a Yugoslavian ex-lawyer, in Clyro, Radnorshire (now Powys) in Wales. Clyro is on the A438 road between Hereford and Brecon and the pottery was named for the 130 mile river Wye which passes nearby. He claimed that when he set up he was one of only four potters working in Wales. Dworski was a self-taught potter who used majolica glazes with brushed decoration mainly on earthenware, but stoneware and porcelain were also used. He made figures, plaques and thrown pots. Work was mainly sold to visitors to the the pottery, but was also retailed in the United Kingdom, Europe and the USA. Mr Dworski exhibited both at home and abroad.